What Makes Pellet Grills Superior? 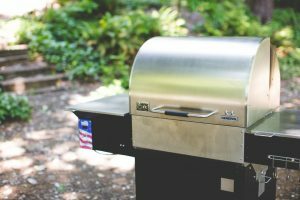 If you have a pellet grill or are thinking about getting one, I’m sure you’ve wondered at some point: “What makes pellet grills superior to charcoal or propane?”. Great question! The answer is simple. Pellets improve the flavor of your smoked meats and they’re better for the environment. Our “gold standard” pellets are Bear Mountain. They’re made here in Cascade Locks, Oregon, and to the best of our knowledge, they have the highest quality control standards of any manufacturer in the business. This means that you can expect consistent results from their pellets, cook after a cook. The Hickory flavor we sell at MAK Grills is a hickory/alder blend, meaning that it burns with less ash than 100% species wood pellets. Burns Hotter – Can you say eco-efficiency? 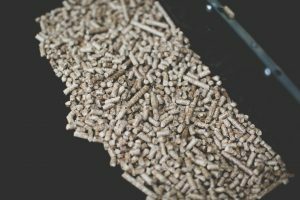 With a higher wood density and lower moisture content, pellets deliver more BTU output per pound and ultimately more heat. Burns Cleaner – Dirt be gone! Since wood pellets are drier and denser, they burn very clean — creating far fewer particle emissions and ash than typical cordwood. Eliminates Build Up – Safe is simple. Wood pellets reduce the risk of chimney fires with little or no creosote buildup, ensuring safe ventilation and easier maintenance. Better For The Environment – Made from all-natural biomass, wood pellets are a carbon-neutral substitute that helps keep our climate in check. Easier to Move & Store – Say goodbye to chopping and hauling! Bear Mountain pellets come in easy-to-carry 20 lb. bags and are denser than logs or chips, carry a higher calorific value, and require far less storage space. Are 100% Species Wood Pellets a Must? Some cooking pellet manufacturers will say that you can only achieve “true” flavors by using 100% species wood. This is an impossible claim to make definitively, quite simply because there’s no accounting for taste. What affects one person’s palate one way may not affect the next person’s palate the same way. There are also potential problems with using 100% species wood to make cooking pellets. For one, the pellets are harder, potentially causing more auger jams. For another, 100% species wood produces much more ash than blends, meaning you’ll have to clean your firepot much more frequently. With a solid brand like Bear Mountain, you should be able to complete 10-20 cooks (depending on what you’re cooking and for how long) before you need to empty your firepot. With other manufacturers, particularly those who use 100% species wood, you could have to empty your firepot as much as every two cooks. There is a test you can run to see how much ash your preferred pellet brand is producing. Starting with a clean firepot, for the first five cooks dump your firepot after every cook; for the next ten cooks, dump your firepot after every second cook; and for the next twelve cooks, dump your firepot after every third cook. This should give you a good sense of the amount of ash produced by your pellets in a variety of situations (low and slow cooks, hot and fast, dinnertime foods). IMPORTANT: We do want to remind everyone to never use fuel pellets (i.e., for wood stoves, etc.) in their pellet cooker. Also, always keep your unused pellets in an airtight container to prevent the intrusion of moisture, as this will render your pellets unusable. The bottom line is that you can use whatever cooking pellets you want in your MAK Grill. We don’t have any proprietary conditions that would prohibit you from burning your favorite cooking pellets. These are simple tips to help with cleanup and grill maintenance. If you use a certain pellet type that gives your dishes a great flavor and you don’t feel that cleanup is more difficult than it needs to be, you’ve probably got a winner! Every pellet brand varies slightly in flavor and pairings. Whether you’re a pellet grilling beginner or a seasoned pellethead, flavor charts are always a helpful tool to reference when planning your next smoked meat-sterpiece. After combining lots of different choice hardwoods, Bear Mountain has figured out how to create the most perfect blends that advance the flavor for each type of food. From the balanced sweet, smoky flavor of their Gourmet Blend, to the mild fruity flavor served up by Cherry, we welcome you to mix and match to create the culinary experience you envision.